The AB SCIEX QTRAP® 5500 LC/MS/MS System is next-generation technology designed to excel at metabolite identification, detection and confirmation of low-level pesticides, and protein/peptide quantitation for biomarker verification and validation. 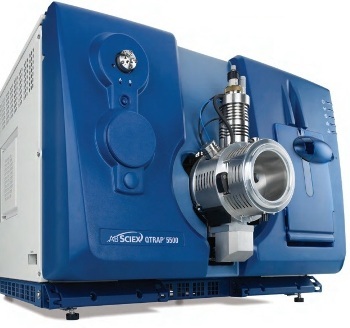 Redesigned from the ground up using our new, fast eQ™ Electronics but bred from our industry-standard triple quadrupole line of mass spectrometers, the QTRAP® 5500 System brings in a new era of performance. The QTRAP® 5500 System also houses the most sensitive ion trap in the world – the all new, patented Linear Accelerator™ Trap – along with offering ultra-fast scan speeds and full MS3 capabilities. Perform multiple reaction monitoring (MRM) scans for quantitation using this high-sensitivity triple quadrupole system. Identify, characterize, and quantitate metabolites more quickly and easily. Discover and quantitate targeted biomarkers. Enable high-sensitivity, full-scan MS, MS/MS, and MS3 with high-selectivity from true triple quadrupole precursor ion (PI) and neutral loss (NL) scans.